There is no doubt that Christmas in Australia is a hot affair. With most locations experiencing temperatures in the high 20’s to mid 30’s, many Aussies opt for seafood, ham and salad for their Christmas fair. This however, doesn’t mean that we don’t crave a traditional hot Christmas dinner. To cater for this craving a new tradition has arrived in recent years – Christmas in July! 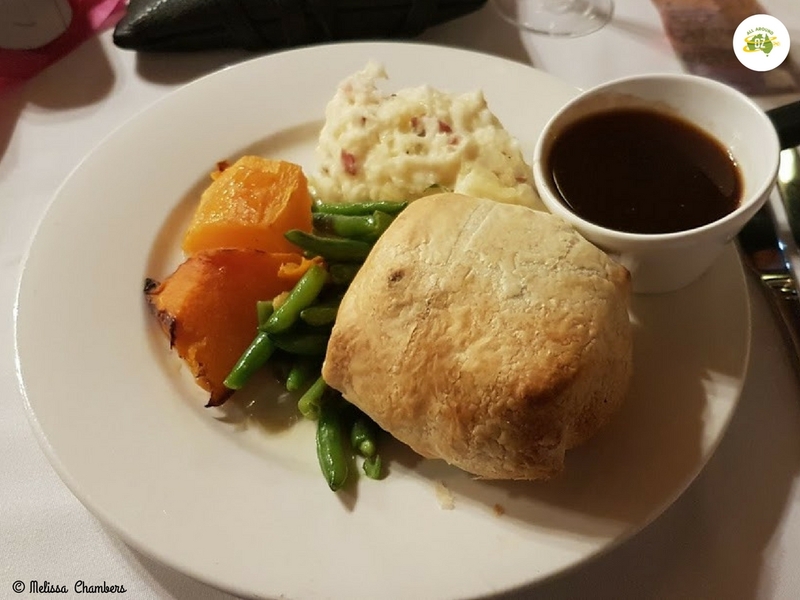 We were able satisfy our craving when we celebrated Christmas in July at St Bernards Hotel at Mount Tamborine. The outside of St Bernards Hotel at Mount Tamborine. 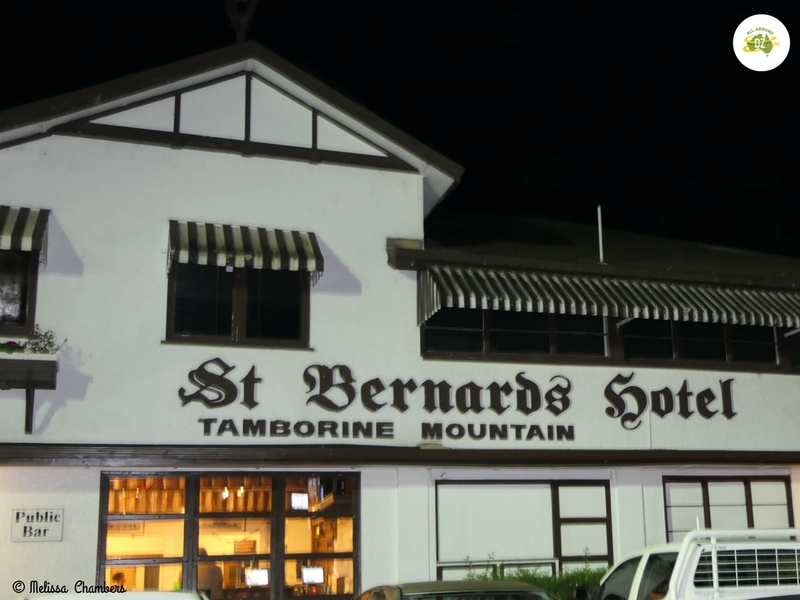 St Bernards Hotel is located in Alpine Terrace and is a Mount Tamborine icon. It was originally built in 1881 as an accommodation house for managers and staff of the Council Quarry. It was moved to it’s present location in 1898. Over the years it has been a Post Office, convalescent home and an accommodation house. St Bernards has an old English pub feel to it. Timber floors, wood paneling, timber ceiling beams, an open fireplace and a wood heater all add to the cosiness of the dining room. The dining room consists of two separate areas. The smaller area would be perfect for a function with a larger group. The main dining area can accommodate several larger tables or they can be set up as small tables. In addition, there is an outside dining area which would be lovely spot to eat in the warmer months. The small dining room at St Bernards Hotel has a lovely old English pub charm to it. 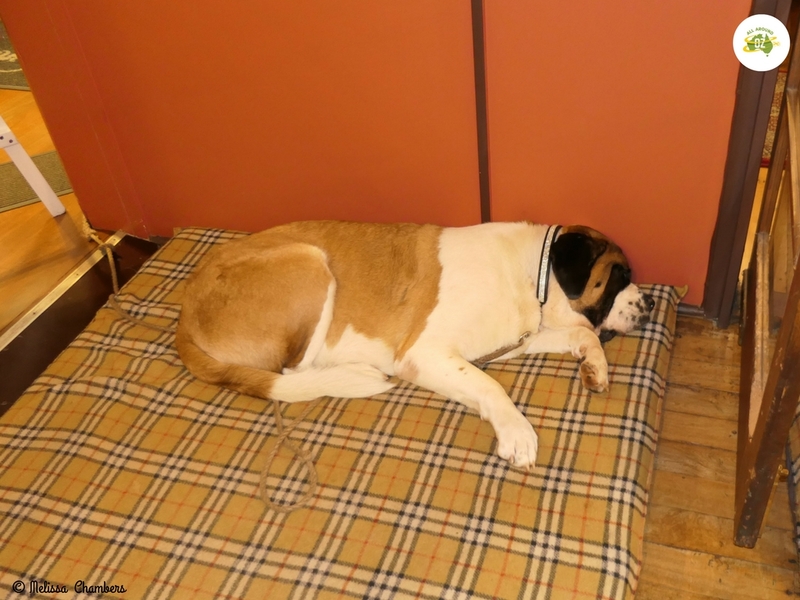 But what would a pub called St Bernards be without a St Bernard dog or two lounging around the premises? Depending on the time of day you will either find them sunning themselves at the front entrance or sleeping on their beds just to the side of the dining area. There are also pictures on the walls of some of the owners previous dogs as well as a couple of almost life sized statues. It is certainly a Dog’s Life for this very spoilt pooch! In general, I thought the menu was excellent. It wasn’t entirely made up of Christmas fare and there were some Vegan choices available as well. Upon arrival we received either a glass of Egg Nog or a glass of Gluhwein. Gluhwein is a warmed red wine with spices added to it. Known also as Mulled Wine, this is what I opted for and it really was delicious. For entree there was a choice of three dishes – a Duck parfait, a barbecued prawn and a Pumpkin and Spinach pasta. Most of our friends opted for the prawn dish and were disappointed with it’s size. It was one large prawn sliced down the middle with a skewer through it. I however had the pasta dish, which was delicious and just the perfect size for an entree. 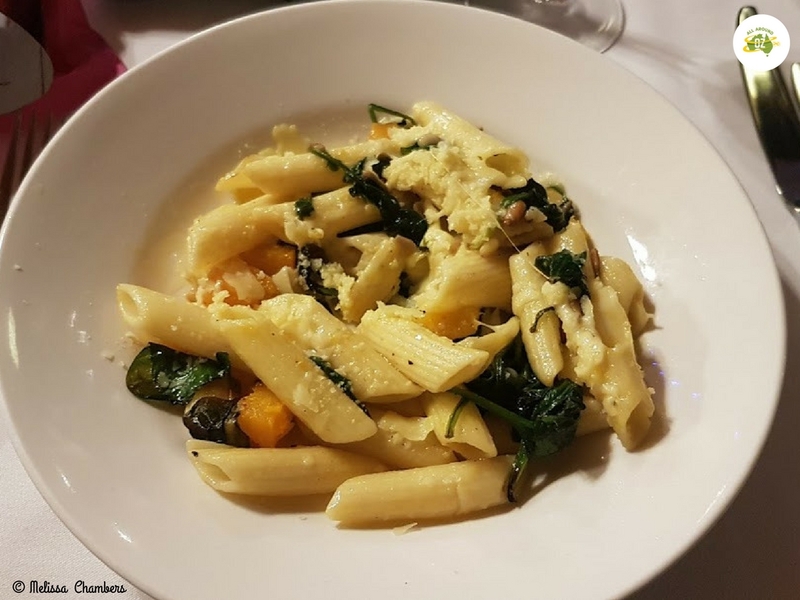 This Pumpkin and Spinach Pasta was a delicious entree. For main course there was a choice of five dishes. These included Glazed Ham, Stuffed Turkey Breast and Fillet Steak wrapped in Pancetta with Mushroom Duxelle, oven roasted in Puff Pastry. This is what I chose as it consisted of two of my favourite food groups – steak and mushrooms! The steak was cooked to perfection for me. It was very tender and still pink in the middle. Brenden had the Glazed Ham which he thoroughly enjoyed as well. This Fillet Steal wrapped in Pastry was absolutely delicious. It was really hard to choose just one dessert from the three on offer although I did manage! Out of White Chocolate Cheesecake, Toffee Pudding and Fig and Muscat Pudding I went with the Cheesecake. Served with cherries in a thick syrup it was sweet and indulgent without being to rich. Dinner was followed with tea or coffee and fresh homemade shortbread biscuits. The cost for the dinner was $65.00 per person which I thought was reasonable given the meals that we received. 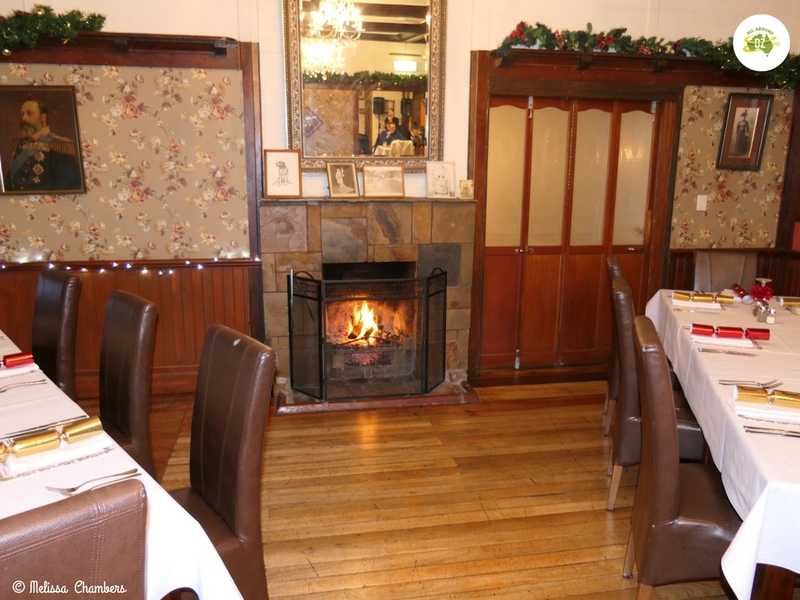 Of course if you can’t get to St Bernards for Christmas in July their dining room is open daily for lunch between 12.00 and 2.00pm or for dinner between 6.00pm and 8.00pm. 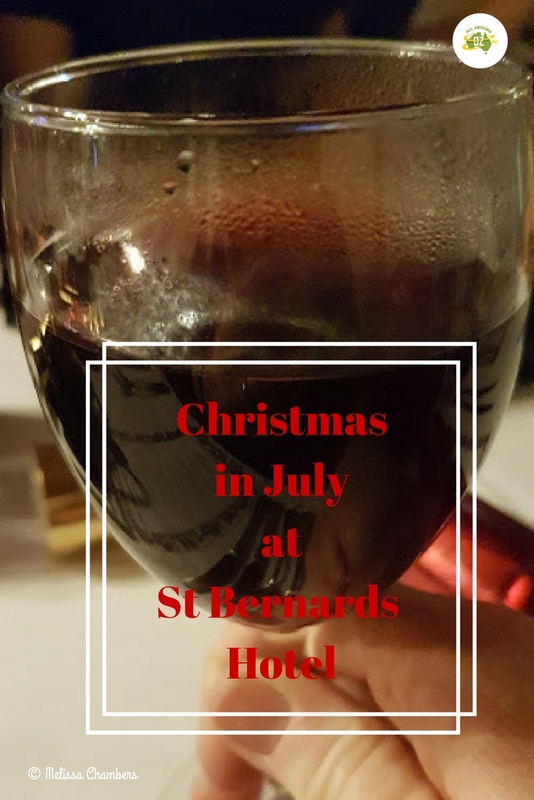 Bookings are essential for Christmas in July at St Bernards Hotel but probably not necessary at other times unless you have a large group. Christmas in July at the St Bernards hotel Mt Tambourine is always great. The delicious food and atmosphere. But lets not forget the great live music that they have had and hopefully will have again. St Bernard’s is always a high priority when we drive up to Tamborine Mountain on a day trip. It’s such an iconic old pub. We used to have golfing weekends up on the mountain many years ago (pre-children) and stayed at the hotel for a few nights. Christmas in July would be so cosy here and I just adore the dogs. The dogs were gorgeous and weren’t bothered by the noise or the guests. One barely bothered to lift his head when I was taking photos. I think Brenden and I will have to head up there for lunch one day when the weather warms up!